Aboard the long-range surveillance P-3K2 Orion and Hercules cargo aircraft, you will learn to operate and manage the complex hi-tech systems that keep them flying. As an Air Warfare Officer (AWO), you’ll hold a key position flying and operating two of the Air Force’s most capable and technologically advanced aircraft – the P-3K2 Orion of the Airborne Surveillance and Response Force or the C-130 Hercules of the Fixed Wing Transport Force. The AWO role has two distinct employment specialisations depending on the aircraft type you operate. The Orion has three Air Warfare Officers in its crew — an Information Manager (IM), a Sensor Employment Manager (SEM) and a Tactical Coordinator (TACCO). (The SEM role can only be reached by first becoming an Air Warfare Specialist.) The C-130 has one AWO on board whose role combines aspects of the three specialist areas. This is a challenging and ever-changing role that will take you the length and breadth of the country and to a variety of locations overseas. You will play a pivotal role in a highly capable crew providing the co-ordination of operational missions and may even have the opportunity to Captain the P-3K2. The two aircraft perform a variety of roles including search and rescue, low level tactical flights, long range flights, fisheries patrols, parachuting, anti-submarine warfare, operational tasking, disaster relief and aeromedical evacuation. On board the P-3K2 and C-130 you will manage a range of high-tech systems to achieve the aircraft’s operational mission. You will play an integral role when it comes to flight planning for an upcoming mission. Prior to departure you will have planned the mission utilising specialised mission planning software. This will enable you to confirm accurate fuel requirements, payload available, make threat assessments and employ tactics to counter these threats. Airborne you will be responsible for real-time mission planning, working closely with the Pilots and the Tactical Coordinator. You will manage all tactical communications including military datalinks, satellite comms and voice to communicate with other military or government agencies. Your duties on the P-3K2 and C-130 will required you to be alert and adaptable to a dynamic and potentially hostile environment. On the C-130 you may be responsible for co-ordinating a parachute insertion of ground troops. This will require you to safely and tactically position the aircraft, co-ordinate with ground forces and ultimately direct the release of the paratroopers from the aircraft into a combat environment. During tactical missions on the newly upgraded P-3K2 Orion, you could be responsible for relaying time critical targeting information to friendly fighters or warships prior to strikes or reconnaissance on targets of interest. When conducting low level operations the AWO coordinates closely with the pilots and radar operator to ensure the aircraft flight path is safe from hazards such as land, airspace or hostile units. Whilst on operations, your job gets even more interesting. For an AWO, flying tactically is both demanding and rewarding. You will be briefed by intelligence specialists prior to the flight and you will plan to use techniques to ensure that the mission is completed safely and expeditiously. You will draw upon your experiences during training and on exercise to overcome time and environmental restrictions in the area of operations. Your role is to ensure the safety of the aircraft in a busy airborne setting. With an array of sophisticated navigation equipment the you will have the most situational awareness of the aircrew on the plane. You will be able to position the aircraft to perform an air load drop to the troops on the ground on time, or ready to provide support during airborne reconnaissance sorties overhead. In addition, you will process any new information the crew received inflight and make an informed decision on its impact on the mission. 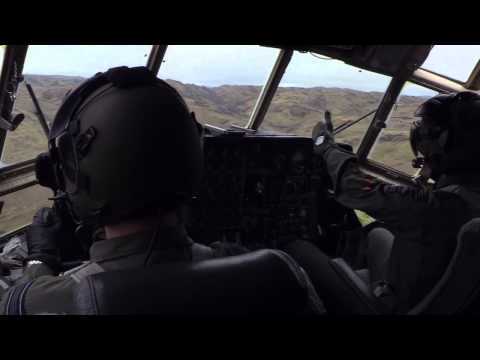 It is because of the dynamic nature of the job and variety of tasks performed, that the role of the AWO is one of the most exciting trades in the Royal New Zealand Air Force (RNZAF). I chose to join the Air Force because I wanted a challenging and diverse career, and I also wanted to travel. Your role will include military command and leadership duties. And, as your career progresses, you can expect to work as an instructor. After basic AWO training, you will complete a conversion course onto the type of aircraft that you will be operating onboard. As part of the initial segment of Squadron flying you will gain specialist qualifications that will expand your abilities and roles they can be employed in. With time and experience you will soon find yourself being deployed as part of local and international exercises with other Armed Forces; and eventually will conduct military air operations in support of Defence Force global commitments in current areas of operations. You will reach a stage where you will return to an AWO training organisation and learn the skills required as an instructor. From there you will be able to pass on what you have learnt to students on initial basic AWO training, and then return to Squadron as part of the instructor team. As a senior AWO, you will complete duties of the Squadron executive/management team as well as continuing to mentor other AWO on Squadron. The course is approximately 11 months long covering subjects such as aircraft technical knowledge, navigation systems, military and civilian communications and electronic warfare. The course includes 100-120 hours of flying training. Once you have graduated from this course you’ll undergo conversion training on to the C-130 or Orion. As well as the courses listed above, at some stage during your career you will be required to complete a Flight Commanders Course. This course lasts two weeks at RNZAF Base Woodbourne and continues your training in command, leadership and management. To become a Flight Commander, all officers are required to complete further courses covering service writing, staff skills and professional military education before being eligible for promotion beyond Flight Lieutenant. There are also two advanced training courses at the New Zealand Defence Force Command and Staff College at Trentham Military Camp (Wellington). Both courses comprise a mixture of visiting lecturers, tutored discussion groups, visits and individual study to give you the skills you need to progress your career. Meet the citizenship and security requirements to gain TSV security clearance for this trade. You must have achieved NCEA level 2 with a minimum of 18 credits each in level 2 English, Mathematics and a Science. Your training is some of the most thorough and advanced in the world. On graduation from the AWO Course, you’ll be contractually obliged to serve another six years in the Air Force. Bear in mind that your role changes every day and you’ll be working in a range of jobs both here and possibly overseas.